We are happy to count on their feminist and humanist commitment through the concrete actions they carry out in the discharge of their mandates. Cyril Pellevat, Senator for Haute-Savoie, VP of the European Affairs, secretary of the Committee on Spatial Planning and Sustainable Development. Marta de Cidrac, Senator for Yvelines, Committee on Spatial Planning and Sustainable Development, Women’s Rights Delegation – President, Balkans Interparliamentary Group. Fabienne Keller, Senator for Bas-Rhin, VP Com Finances, official elected in Strasbourg, former spokesperson for Alain Juppé, National Delegate for Agir. Joëlle Garriaud-Maylam, Senator for French Citizens living abroad. Secretary of the Armed forces, Defense, and Foreign Affairs Committee. VP of the Delegation for Women’s Rights and Equality of Opportunity between Men and Women. National Secretary for Les Républicains. Yves Détraigne, Senator for Marne, Member of the Court of Justice of the Republic, Witry-lès-Reims City Councillor. Max Brisson, Senator for Pyrénées-Atlantiques (Nouvelle Aquitaine), VP of the Delegation for Women’s Rights and Equality of Opportunity between Men and Women, Culture, Education and Communication Committee. Are you a male or female senator? You can do the same: Don’t leave out half of humanity. Join the citizen movement! 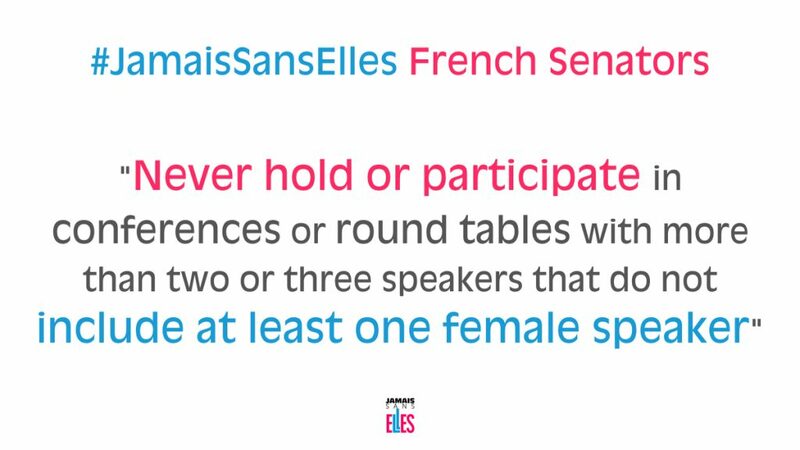 Take on the #JamaisSansElles commitment for each of your actions and all of your events. To sign the pledge, post a commitment tweet with the hashtag #JamaisSansElles, or a comment, in this post with your name, the name of your constituency and your Twitter account information. Thank you.